'Frame It Once, Frame It Right, Love It Forever"
Eric Mauskopf, President of J. Pocker Custom Framing & Fine Art, just announced the launch of his new website http://www.jpocker.com, your online destination for custom framing, mirrors and fine art. We hope that by offering an online panorama, we will be able to better serve our existing client base who already know and trust our craftsmanship, as well as introduce J. Pocker to new clientele. With showrooms in NYC, Bronxville, Greenwich and Westport, our website now offers an educated experience to a larger global audience. It will also reveal our newest products, such as TV frames and acrylic mats. Each member of J. Pocker's design team is hand-picked for their extensive knowledge and experience within the framing industry. 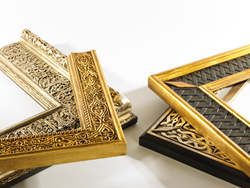 With backgrounds in art and art history, the sales staff is confident in helping their clients pick the perfect frame from the initial consultation through installation. We have a large library of prints and reproductions and a dedicated staff that helps clients not only select the right prints for their home but helps design and frame them.